Police have released images of people that may have witnessed a suspected murder that they want to trace. 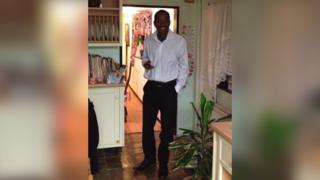 Simon Mushonga, 39, from Bedford, died a day after he suffered serious head injuries in an attack in Carrington Street, Kettering, on 7 December. Two people have since been charged with murder and manslaughter. Northamptonshire Police said they had now identified five people who were in the area at the time of the assault against Mr Mushonga. Det Con Ruth Banyard of Northamptonshire Police, said: "We are hoping to trace and speak to these people as they may have witnessed the incident or the circumstances immediately before or afterwards." She added: "Even the smallest detail could really help." Mr Mushonga's family said they were "shocked and devastated" after his death. Aaron Muggleton, 25, has been charged with murder and a 16-year-old girl has been charged with manslaughter. Mr Muggleton, of Alexander Street, Kettering, and the teenager who cannot be named for legal reasons, have also been charged with actual bodily harm in connection with an assault on another man during the same incident. Mr Muggleton has also been charged with possession of a class B drug.